The Far Eastern or Amur leopard (Panthera pardus orientalis) is already among the rarest of the world's big cats, but new research reveals that it faces yet another threat: infection with canine distemper virus (CDV). A new study published in the Journal of Wildlife Diseases describes the first documented case of CDV in a wild Far Eastern leopard. The case involved a two-year-old female leopard that was found along a road that crosses the Land of the Leopard National Park, in the Russian territory of Primorskii Krai. "The leopard was extremely sick when she was brought in, and had severe neurological disease" said Ekaterina Blidchenko, veterinarian with the National Park and the TRNGO Animal Rehabilitation Center. "Despite hand-feeding and veterinary attention, her condition worsened, and a decision was made to euthanize her for humane reasons." Although CDV is well known in domestic dogs, it also infects a wide range of carnivore species, including big cats. In 1994, a CDV outbreak in Tanzania killed over 1,000 lions in the Serengeti National Park. 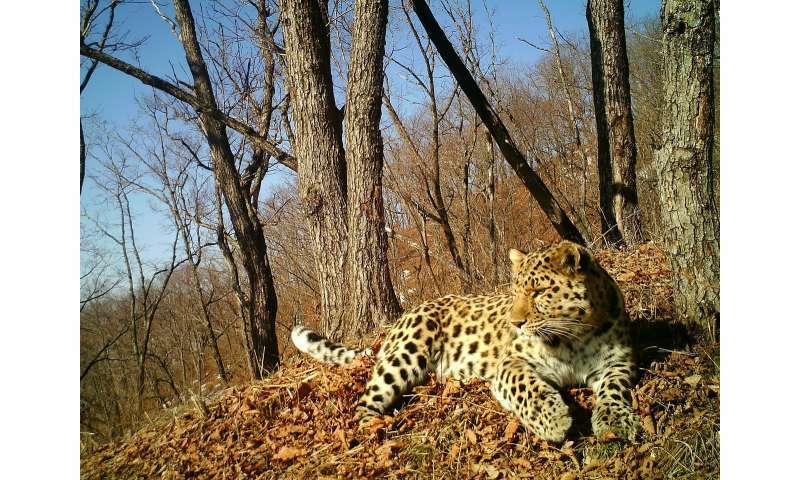 Said Nadezhda Sulikhan, a scientific staff member of Land of the Leopard National Park and Ph.D. candidate at the Federal Scientific Center of East Asia Terrestrial Biodiversity (part of the Far Eastern Branch of the Russian Academy of Sciences): "The leopard virus was genetically similar to infections we've diagnosed in wild Amur tigers. But we think these infections have spilled over from a disease reservoir among domestic dogs, or common wild carnivores like badgers and foxes." Unlike the situation for a social species like lions, outbreaks of CDV are likely to spread more slowly among more solitary cats like leopards and tigers. However, even infrequent transmission can have profound consequences for the species concerned. Research has estimated that extinction of small populations of tigers is 65 percent more likely when they're exposed to CDV. Globally, carnivore populations are being pushed into smaller and more fragmented islands of habitat. If these trends continue, infectious diseases are likely to become a greater threat to carnivore survival in the future. Said Dr. Martin Gilbert, Wildlife Health Cornell Carnivore Specialist with Cornell University's College of Veterinary Medicine: "As carnivore numbers decline, they face a greater risk from chance events like outbreaks of disease. With such a limited breeding population, even a small number of deaths from disease can be the difference between the survival of a population or extinction." The combined pressures of habitat degradation, hunting and prey depletion have already marginalized this subspecies to a single population of approximately 80 individuals along the border of the Russian Far East and neighboring northeast China. Conservationists now need to understand the severity of this new-found threat, and also where it is coming from, as this information is critical for developing measures that counter the disease's impact. Said Dr. Sulikhan: "Until we know where the virus is coming from, it is impossible to target vaccinations or other interventions to prevent infections in leopards. We are now working to unlock this riddle, and understand the importance of domestic dogs versus wild sources of the virus." For now, the most effective way to combat this new disease threat is through traditional carnivore conservation approaches; reducing hunting and protecting habitat. Dr. Dale Miquelle, Director of the Wildlife Conservation Society's Russia Program and co-author of the paper, said: "By increasing the size and connectivity of leopard populations, they become more able to cope with losses from infectious disease, vastly reducing the risk of extinction"
Said Tatiana Baranowska, Director the Land of the Leopard National Park which holds the majority of Far Eastern leopards left in the world: "We are doing our utmost, in concert with our Chinese colleagues, to improve and expand leopard habitat to enlarge the existing population. Although disease and other threats are looming, we have great hope that our current and planned efforts will secure a future for this unique big cat."